The weekend after Thanksgiving is considered by many to be the unofficial start of the holiday season, and across the Town of Huntington there are plenty of events to help kick off the most wonderful time of the year. Mark these holiday-themed gatherings on your calendar because it’s about to look a lot like Christmas. The Huntington Harbor Parade of Lights is back for a sixth time this holiday season, after a one-year hiatus. Boats of all shapes and sizes will cruise Huntington Harbor from the Harbor Boating Club to the Huntington Yacht Club to show off their creative light decorations. The parade benefits the Huntington Lighthouse Preservation Society, and prizes will be handed out for 10 different categories. The parade kicks off at 6 p.m., and visitors can watch the boats sail by from various spots around the Harbor, including Mill Dam Park or the Halesite Marina. The annual tree lighting ceremony in the Northport Village Park and the west end of Main Street in Northport will take place once again on the Friday after Thanksgiving. The Northport Fire Department and the Northport Chamber of Commerce sponsor the event, which begins at 4 p.m. when live reindeer arrive in the park to kick off the holiday cheer. No need to worry about cold weather as hot chocolate will be provided by Copenhagen Bakery, Tim’s Shipwreck Diner, and Feed and Grain of Northport. The Northport Chorale will set the mood with caroling, and Santa is coming to town on the back of a fire truck. The tree lighting will take place at 7 p.m.
For the first time in its eight-year history, the Town of Huntington Holiday Parade is set to kick off on the Sunday after Thanksgiving. Ellen O’Brien, of the Huntington Chamber of Commerce, said the change was made to accommodate local businesses that were hurt by the road closures on Small Business Saturday during previous years. The parade will begin at 5 p.m. near the Big H Shopping Center and floats from local fire departments and residents will march down New York Avenue to Main Street, then head west on Main Street to West Neck Road. This year’s grand marshal is Mike DelGuidice of Big Shot, who will perform along with the North Shore Pops at the tree lighting ceremony following the parade in front of the movie theater on Wall Street. Free parking will be available at the Huntington Train Station with a free shuttle that runs from 4-9 p.m. The Cold Spring Harbor Fire Department will host its annual tree lighting ceremony in the park across from the firehouse on Main Street in Cold Spring Harbor. There will be hot chocolate, coffee and other refreshments available. “We are proud to announce our annual tree lighting and tree sale; Santa will arrive at 6 p.m. with toys and hot cocoa for all,” Chief Dan Froehlich said. The tree lighting ceremony is scheduled for 6 p.m., and is part of the annual tree sale that runs from Dec 1-3. The Chabad of Huntington Village will host a Chanukah dreidel-making workshop at the Home Depot in the Big H Shopping Center at 785 New York Ave. in Huntington. The event is open to all, but those interested must RSVP at JewishHuntingtonVillage.com/RSVP. There is no charge to build the dreidels, and the event runs from 3-5 p.m. Those who attend the event will also hear Jewish stories with Chaya Raskin. For more info, call 631-276-4453. 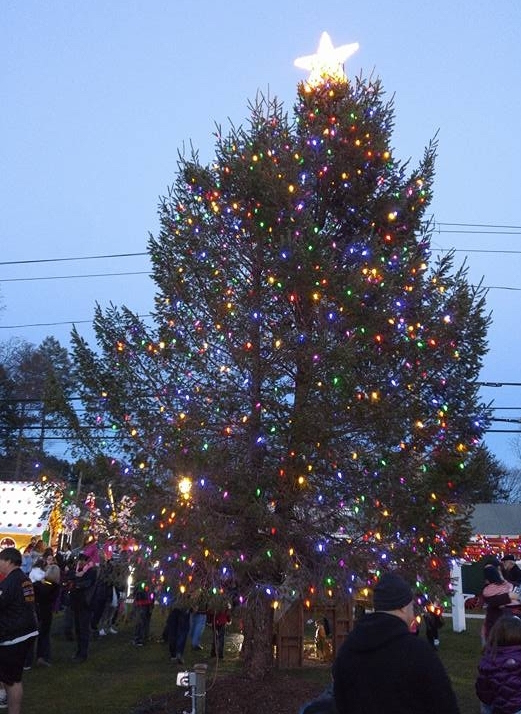 The Greenlawn Civic Association will once again host its holiday tree lighting ceremony at the Harborfields Public Library at 31 Broadway in Greenlawn. The event runs from 3:45-5 p.m. “This year, the Greenlawn Civic Association has a special arrangement with Santa to have a mailbox at the Holiday Tree Lighting," said Rachael Risinger, the association’s co-chair for events and fundraising. "Children can mail their letters to Santa with special delivery to the North Pole.” Santa is set to arrive on a Greenlawn Fire Department truck to light the tree, and the civic association will be accepting new and unwrapped toy donations for the Harborfields Alliance for Community Outreach to benefit local children in need.